Asien gegen ende des 18th Jahrhunderts. Die Briten in Indien; das Reich der Mandschu. 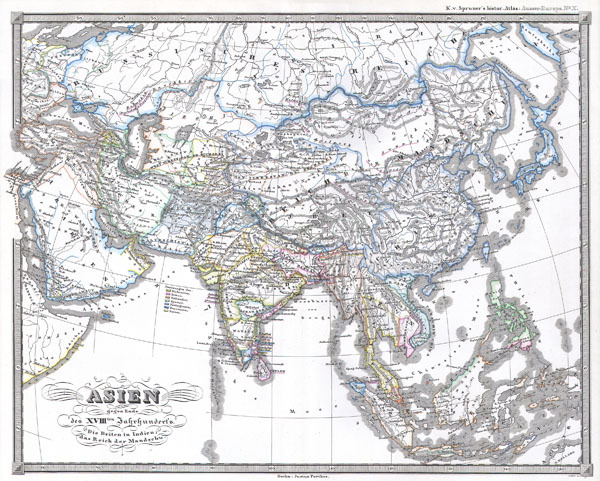 This fascinating hand colored map depicts Asia at the end of the 18th century. The British had established themselves in India and the Chinese Empire was under Manchu control. Also depicts Southeast Asia in good detail with early versions of Vietnam (Anam & Tonkin), Cambodia (Kambodscha) and Thailand. Singapore is labeled Published as part of Karl von Spruner's Historical Atlas of 1855.